Many Internet users at least once, and such term heard, like Ping. In this article, we will tell, What is Ping, what it means, and how it can be checked. Ping is the time period, for which a computer sent back to another computer bag. This mechanism can be compared to the procedure accurately determine the distance to the Moon: from the Earth to the Moon (where special mirror mounted) "Sent to" a beam of light, and note the time, When this beam is reflected from the mirror and come back. The speed of light is known, "Flight" time, too,. To calculate the speed is not a problem. Similarly, the Internet connection speed is determined. The computer sends to a specific server (it can be any site) bags and then get them back. The time between sending a packet and its reception called ping. The smaller the return package, the higher connection speed. Then press Enter and follow the results. If the packets are returned, the program will indicate the time. If you do not come back (compound with poor or no) - The program will indicate the number of packets, who did not return. 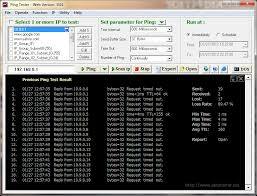 In addition, there are many online services, which may verify and analyze Ping connection speed. Ping in the game - is the response time of another computer. This concept is used to determine the quality of the connection in online games. Slow ping regarded as a "brake". Quick as, conversely, allows time to see the actions of the enemy and have time to take action. On the Internet, you can download a variety of programs, that will improve Ping games.